This is a very healthy and delicious dish. Boil water with salt and 1 tsp of oil. Add hot water a little by little to the rice flour while kneading. Knead till you get a soft dough. Grease the Idiyappam presser with oil. Stuff the presser with dough and gently press on idly plates and steam cook. Cool and keep aside. 1. Soak urad dhal for atleast 2 hours along with red chilly. Drain water completely. 2. Grind dhal, red chilly, asafoetida and salt together to a coarse consistency. 3. Place the ground mixture on a oil greased idly plates. Steam cook for about 10 minutes. Let the mixture cool. 4. Now, crumble with a spoon. Keep aside. 5. Heat oil in a pan. Splutter mustard. Add curry leaves and coconut. Fry for few seconds. 6. Transfer the crumbled dhal mixture to the pan. Medium the flame. 7. Combine the ingredients together. Cook for 5-10 minutes. 8. Before you switch off the stove add coconut oil. 9. 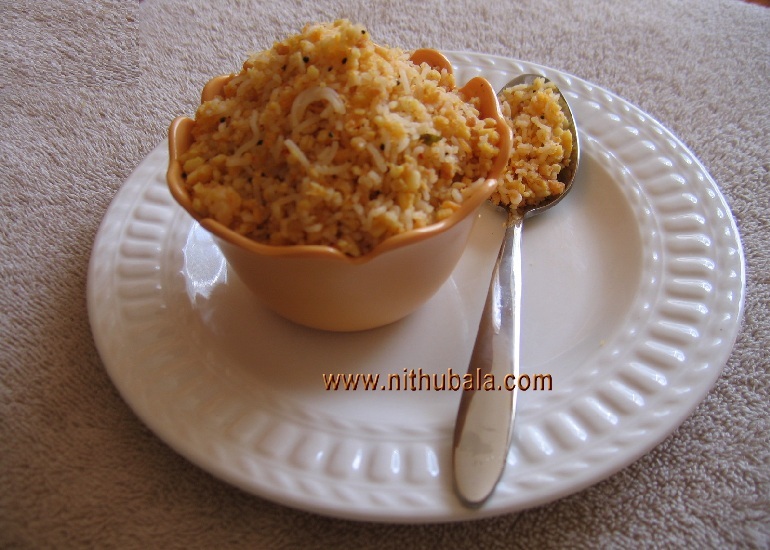 Once the urad dhal mixture is cooled, add this to the idiyappam. Mix them together. Add a little gingelly oil if the Idiyappam looks dry. This way of making idiyappam is new to me. But looks delicious.. Perfect for breakfast. Nice healthy and tasty one !!!!! very interesting.. new to me.. I am drooling.The idiyappam looks super delicious and I would love to gobble up the entire cup. Looks so delicious.. Never heard of the idiyappam with Ulundu though!! Yum it should be! Its been ages i had this savoury idiyappam,love it.